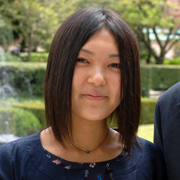 Ayaka Ogawa lost her entire family on March 11, 2011 when the tsunami struck her hometown of Kamaishi in Iwate Prefecture. Yet her resilience, grace, and optimism for the future in the face of profound tragedy has inspired many, as demonstrated in her moving remarks at a April 18 TOMODACHI event. Ayaka moved to the United States in Fall 2012 for a one-year study program in Michigan, and shared her initial impressions with us. Q: What was your first impression of Michigan and America? And how does it compare to your hometown? A: The first impression I had was: nature! I am delighted by the fact that I get to be somewhere where nature is so beautiful. I will definitely not forget the view I saw from the airplane. My hometown also had great natural beauty, and coming here made me further realize that nature has a calming effect on people. I believe that being in this relaxing environment will help me in this new life in America where I still don’t understand English. Lake Michigan is very close. It’s only two to three minutes away, so I walk there every day. I love walking on the beach with my bare feet; it’s a wonderful feeling. Although it’s a lake, I also get to see the moment where the sun sets below the horizon. Every day, I get to breathe fresh air since I am surrounded by beautiful trees and plants. It feels like the school is located inside the forest itself. Blocks of wood are spread all over the campus, which lets me feel the warmth of trees in each step. Additionally, there are no days that I don’t see a squirrel. There are many here and I’ve even seen them inside the school building! Q: What is it like to live in an environment where no one speaks Japanese? A: The first three days here were certainly tough for me. When I look back, however, at the hardship I experienced with the disaster, and thought about why I am here as well as what I need to do now, it encouraged and cheered me up. No one else speaks Japanese here. But I think this is the kind of environment that challenges me to grow as a person. There are many things in English that I still do not understand. I am, however, slowly but surely getting better at understanding what people are trying to say. As of now, I can say a few words and use gestures to get my thoughts across. I keep a notebook with me at all times, taking down terms and other general things I haven’t heard of before in order to look them up later at night. It is frustrating when I don’t know how else I can express my thoughts, how I should say things in different environments, and when the right words don’t come out. But my determination to study English has grown even greater now that I am here in America. Q: What do you hope to get out of this year abroad? And how do you think the skills you will acquire help you in the future? A: Simply to learn English. It may sound straightforward, but by learning English, I will definitively have more options on what I can do and would like to do. I also think that the English language will open up more doors and opportunities in the future.